How I use an iPhone 8 Plus, an iPad, and a MacBook Air in my daily life. This review is going to be short and sweet. That's because if you have an iPhone and use AT&T Wi-Fi even on a casual basis, you should pick up Easy Wi-Fi For AT&T [iTunes link]. It's free until this Friday. This app basically automates logging onto an AT&T Wi-Fi hotspot. Previously, I had to login with a username and password and that takes a while. Then, after the SMS login was introduced logging in was better, but still a lot of work just to get on the hotspot. With Easy Wi-Fi, all you have to do is provide your 10-digit cell number in settings and with one click of the app from your home screen, you're logged on! I tried it today at Starbucks and it was very simple to use. If there was a criticism of this app, the red log out button is a little too large and too low making it easy to accidentally log out. And you can only log on once in a 24-hour period, or something to that effect. I know because I accidentally logged out using the normal iPhone preferences. This app will NOT work with iPod Touches because they don't have a 10-digit phone number. Eventually, I want to test if I can log on to the AT&T Wi-Fi at McDonald's. 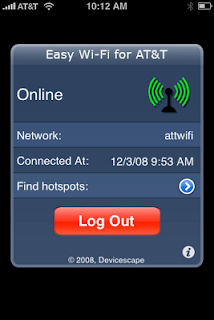 This app is a godsend especially since AT&T just bought Wayport and added nearly 20,000 hotspots to its Wi-Fi arsenal.